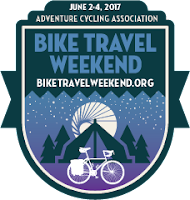 The mission of the Adventure Cycling Association is to inspire and empower people to travel by bicycle. 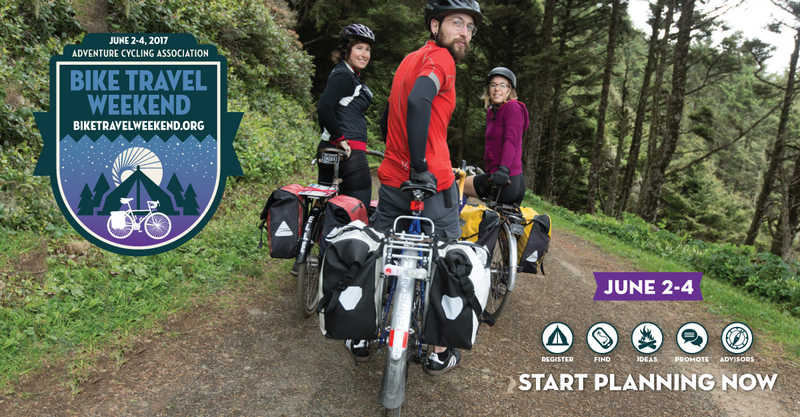 June 2-4 has been designated as National Bike Travel Weekend, when we're joining them to encourage anyone to try taking an overnight trip by bicycle. On June 3, 2017, we're transforming our Night Ride on the Towpath Trail into a Bike Camp-Out Night Ride! Space is limited to 32 people! Click here to register yourself and any family members. The cost is $10 per person. Between now and Saturday, June 3, make sure you've got the necessary camping gear and related stuff. On June 3 between 6:00 and 7:00pm, park your car at Heritage Farms (6050 Riverview Road in Peninsula), and set up your tent and other camping gear. Ride your bike the short distance down to the Century Cycles store in Peninsula (about 1/2 mile) to join the Night Ride on the Towpath Trail. We'll leave for the Night Ride at 8:00pm sharp. 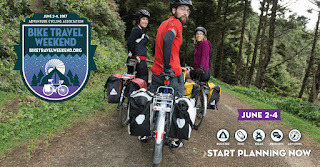 We'll ride on the car-free Ohio & Erie Canal Towpath Trail with the regular Night Riders for about 7 miles down to the Botzum Trailhead, then turn around and head back to Peninsula. Campers will head up to Heritage Farms (a short stretch of road riding will be required again) to enjoy campfire stories and snacks before turning in for the night. Feel free to bring some post-ride snacks and beverages for yourself and/or to share. The next morning (Sunday, June 4), wake up at your leisure, pack up your gear, and head home. Okay, so technically this isn't "bike-camping," but "car-camping with a bike ride!" That will make it a little easier to pack, and you won't have to worry about packing all of your camping gear on your bike (unless you want to skip the car altogether and ride your bike from home to Heritage Farms). If you've never been on one of our Night Rides on the Towpath Trail before, please see this page for general information, preparation and safety tips, and photos and videos from past rides. We have eight camp sites reserved. Each camp site accommodates a maximum of two tents/four people each, so join up with your family and friends!